I'm finally setting aside some time to scan in my Winfield collection and figured I'd post some blog updates on some of the more interesting cards. 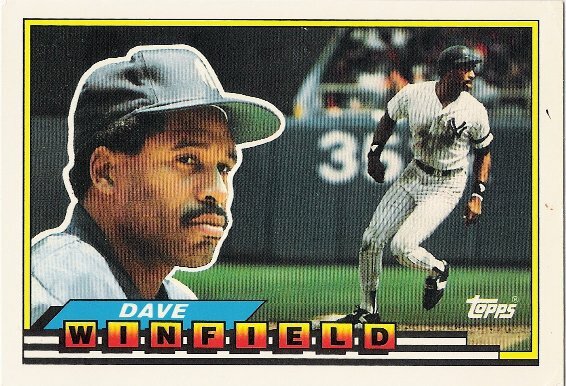 I'd like to start out with the oddball cards I've come across. 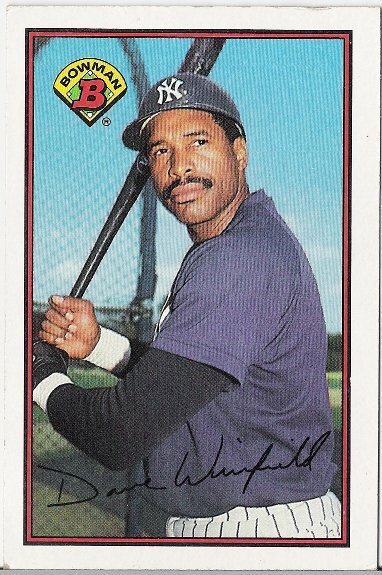 There are far more cards out there than what I am posting here, but I'm going to focus on stuff I actually have in my collection. So lets start out with the larger cards. I love them and I hate them! On one hand its great to have a nice big print of my favorite player. But on the other hand, they don't fit in my binder with the other cards (stuff like '89 Bowman does but sticks out on the top) so I need to put them in a shoe box with the buttons and Starting Lineup figures (I'll get to those in a future update) and rarely get to view them. For fun I'm going to post them in order of size from smallest to largest. Click on each picture for a larger (pun intended) image. 2 1/2" by 3 3/4"
The 1989 Bowman set, produced by Topps, contains 484 slightly over-sized cards. 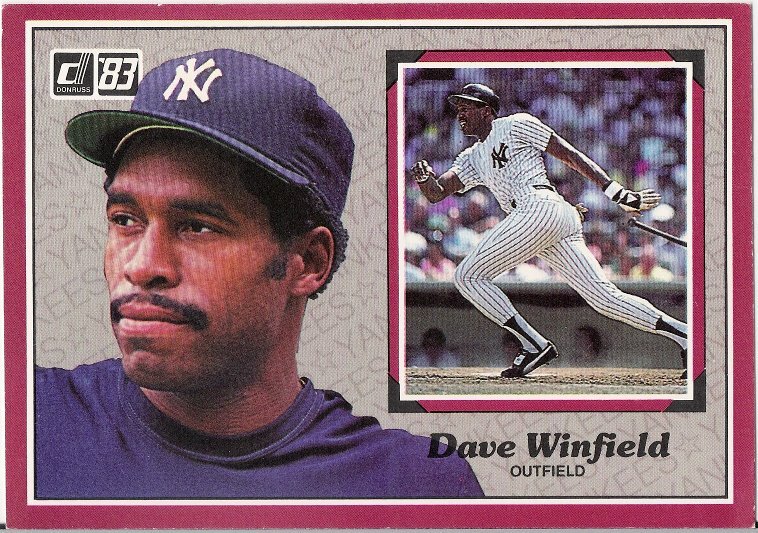 The cards were released in mid-season 1989 in wax, rack, cello and factory set formats. The fronts have white-bordered color photos with facsimile autographs and small Bowman logos. 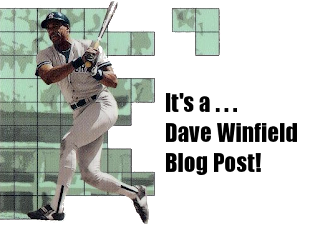 The backs feature charts detailing 1988 player performances vs. each team. I don't remember these being very popular when they came out. But now I really enjoy the size of them. 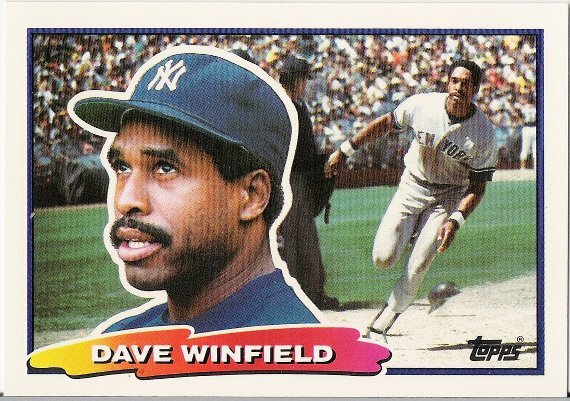 This one fits well with Winfield's stature. Not too many cards out there with a vertical design like this! 2 1/2" by 4 3/4"
Each pack of this 400 card set contained at least one insert card. 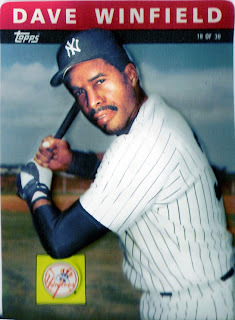 Full-bleed fronts contain a large color photo with the player's name and Extra Bases logo at the bottom. The backs are also full-bleed with a large player photo and statistics. This is about as tall as it gets when it comes to the smaller cards. I remember Fleer did a basketball and Spawn comics set at this size in 1994 also. 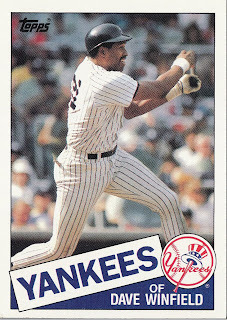 2 5/8" by 3 3/4"
This set of 264 cards was issued as three separately distributed series of 88 cards each. Cards were distributed in wax packs with seven cards for a suggested retail of 40 cents. These cards are very reminiscent in style of the 1956 Topps card set. Strange choice for Winfield's portrait here! What's he looking at? 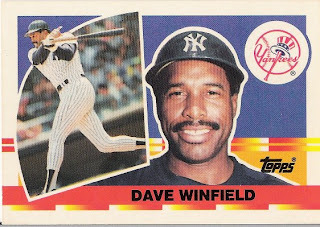 The 1989 Topps Big Baseball set contains 330 glossy cards.. The fronts feature mug shots superimposed on action photos. The horizontally oriented backs have color cartoons and statistics for the player's previous season and total career. 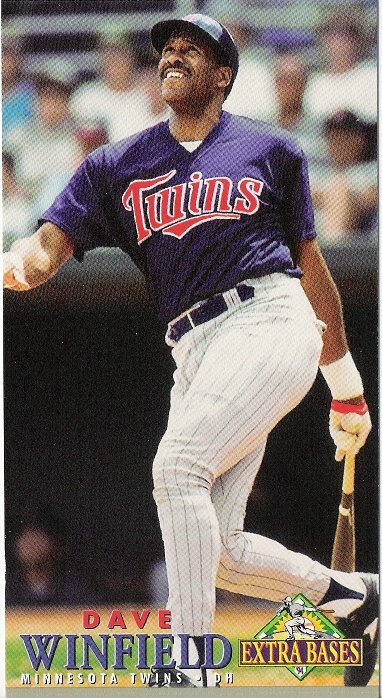 The set was released in three series of 110 cards. 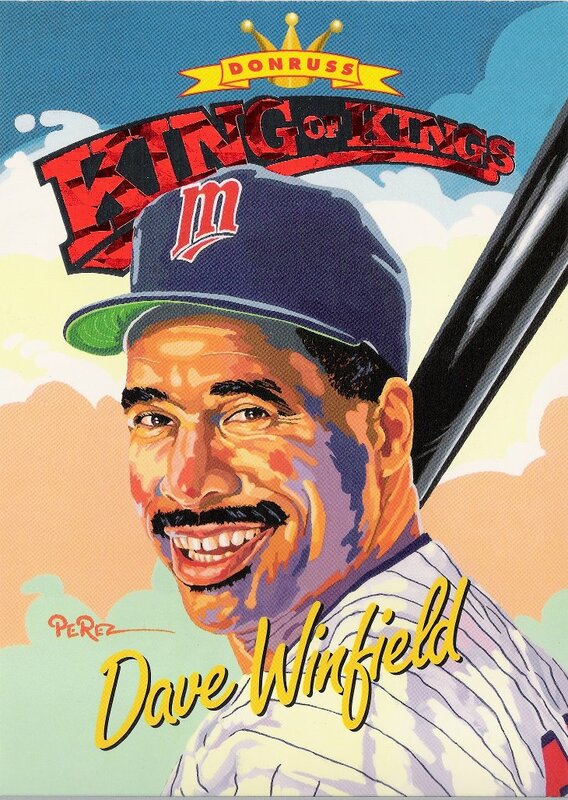 The 1983 Action All-Stars series depicts 60 major leaguers in a distinctive new style. A 63-piece Mickey Mantle puzzle (three pieces on one card per pack) was marketed as an insert premium. I remember finding these packs at a local flea market and searching for the Winfield through the wrapper. 4 1/4" by 5 7/8"
This innovative 30-card set was issued in packs of one. These large cards are very difficult to store (due to the 3-D effect) as they are not really stackable and are crumpled if placed in an album using plastic sheets. The cards are blank-backed except for two covered adhesive strips. Cards are numbered on the front and feature a prominent team logo on the front as well. This one stands out in my collection (and not just because it's embossed!). Unfortunately I haven't been able to think of a good way to encase it yet. 3D may be 'in' right now but I doubt we'll ever see embossed cards like this again! 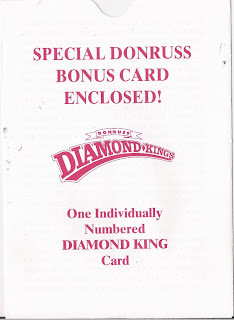 These cards were issued one per retail box. The cards are serially numbered to 10,000 and are just a jumbo parallel version of the regular Diamond Kings. I actually really like this one. These paintings are always best when viewed in a larger size. 4 7/8" by 6 7/8" This 60-card set was issued in packs of three. The fronts of the cards are merely a blow-up of the Topps regular issue. In fact, the cards differ from the corresponding cards of the regular set in size and number only. As one would expect, only those considered stars and superstars appear in this set. Backs are green with maroon printing.